Client loyalty is the Holy Grail for lawyers. Not only do loyal clients continue to feed your coffers, they also bring you new clients by way of referral. You want them. You need them. But getting and keeping them is challenging in this era of ever-changing communications channels — the control of which is mostly in the hands of consumers. The satisfied — continues to stick with a brand because they are satisfied with the brand’s performance over time. The brand is familiar and dependable, and delivers consistently good performance. The satisfied feel comfortable with the brand and see no reason to change. The committed — this group has a more involved relationship with the brand and is more likely to have an emotional attachment. They tell others about the brand, becoming a de facto brand ambassador. The goal of your law firm should be to develop a committed group of clients who have an emotional bond with your firm, tell others about it, and frankly feel like they couldn’t imagine being without you. Dependability— always delivers to expectations and can be trusted. Social media— has interesting and engaging content online. Heavy emotional connection— connects with the client emotionally and has a purpose the client believes in. The above graphic shows that the strongest links to the committed loyalty group are dependability, being better than competitors, and having a high emotional connection with the client. These are the areas your law firm should focus on in order to create and nurture this group, moving beyond “dependable” to “better” in both messaging and execution. 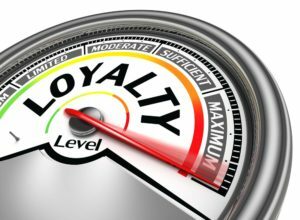 Client loyalty has many levels, and to develop and leverage this within your client base means you need to deliver beyond the basics and craft a marketing program for your law firm that builds your brand on the base of these loyalty drivers.